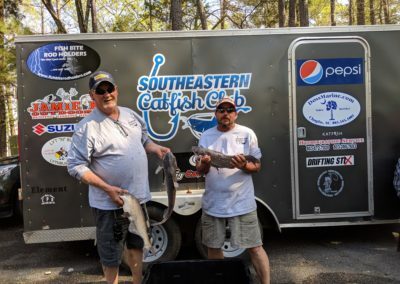 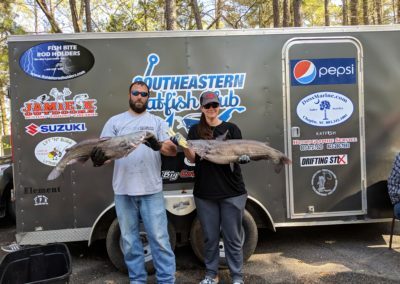 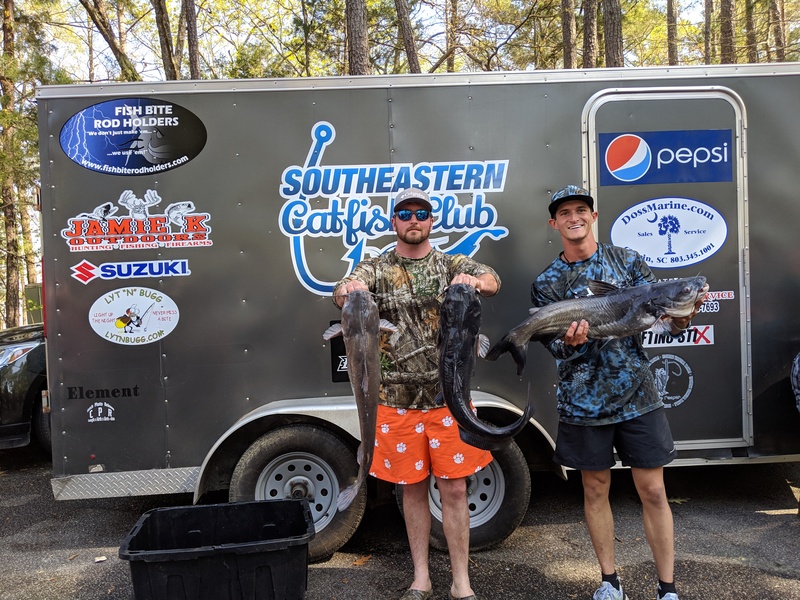 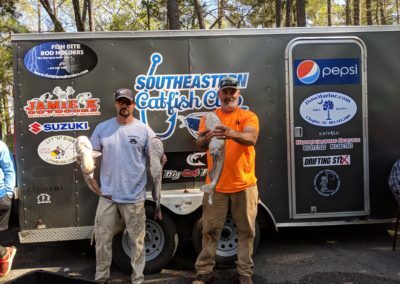 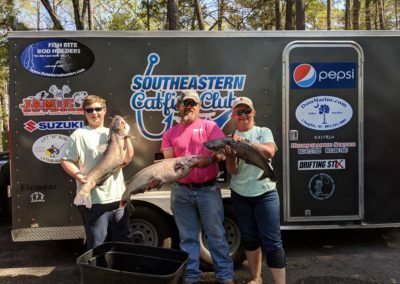 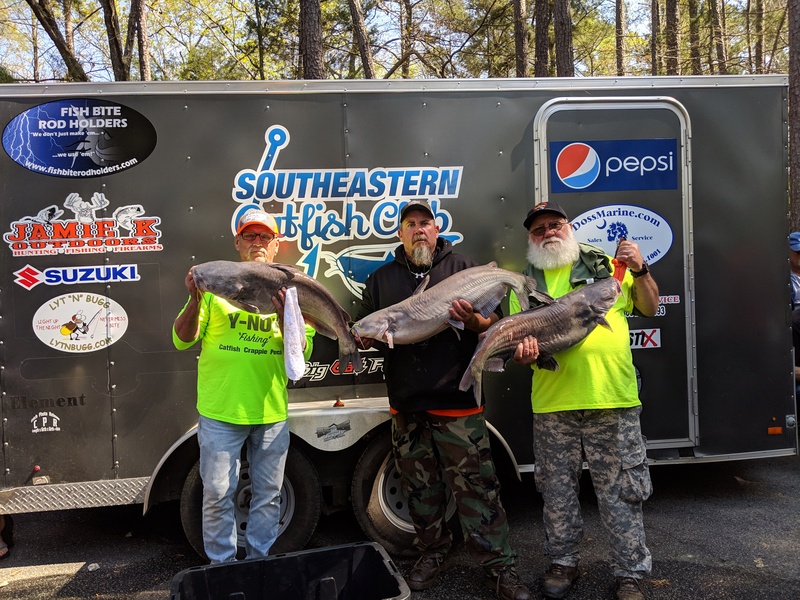 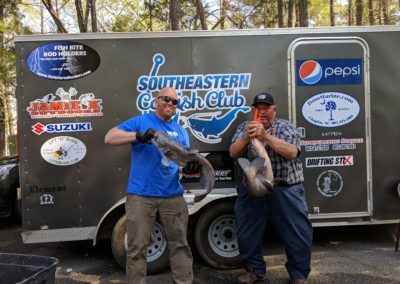 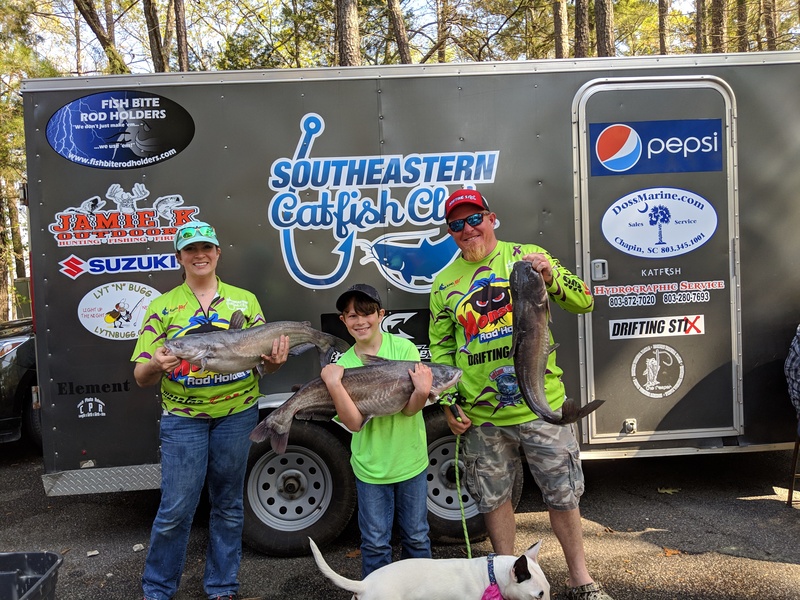 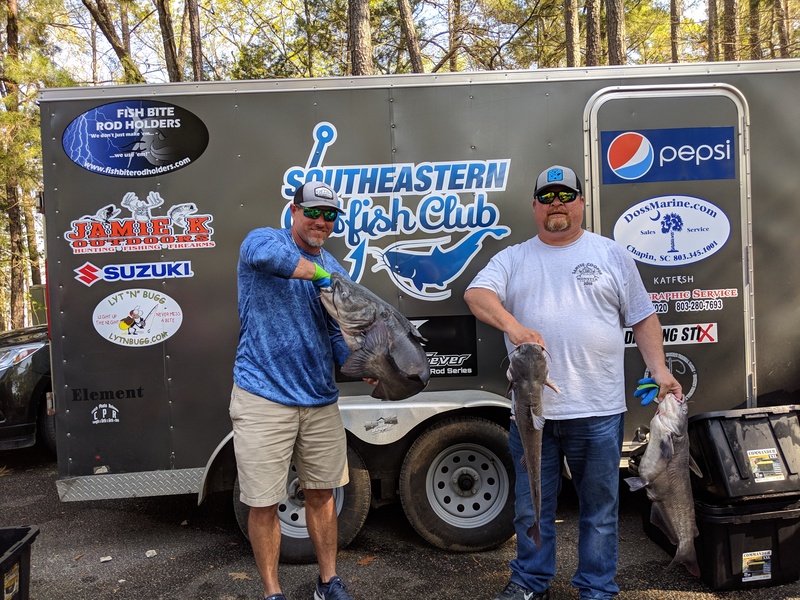 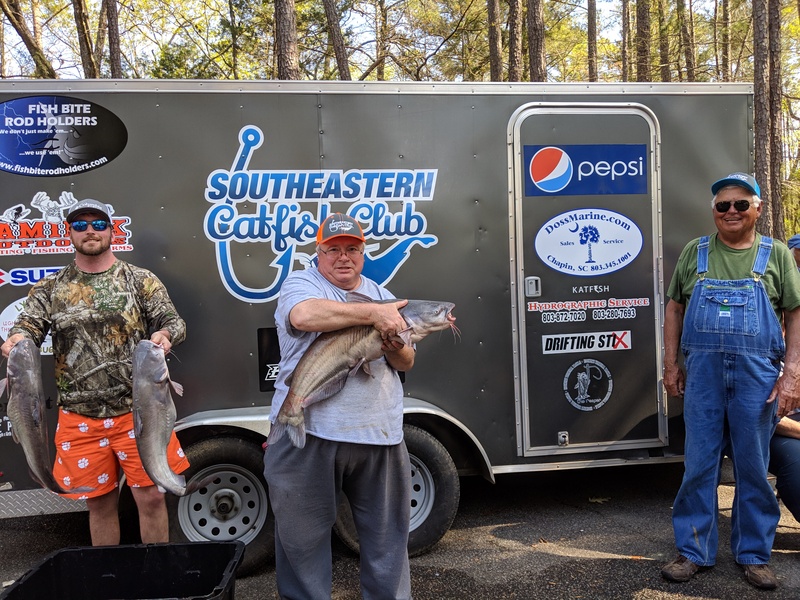 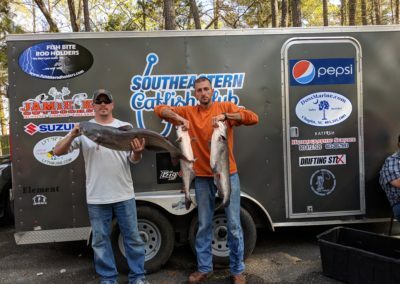 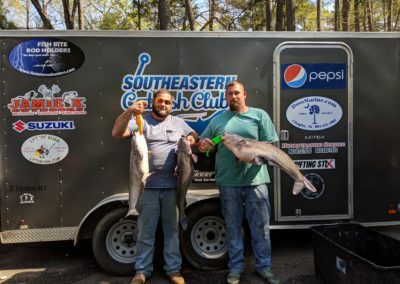 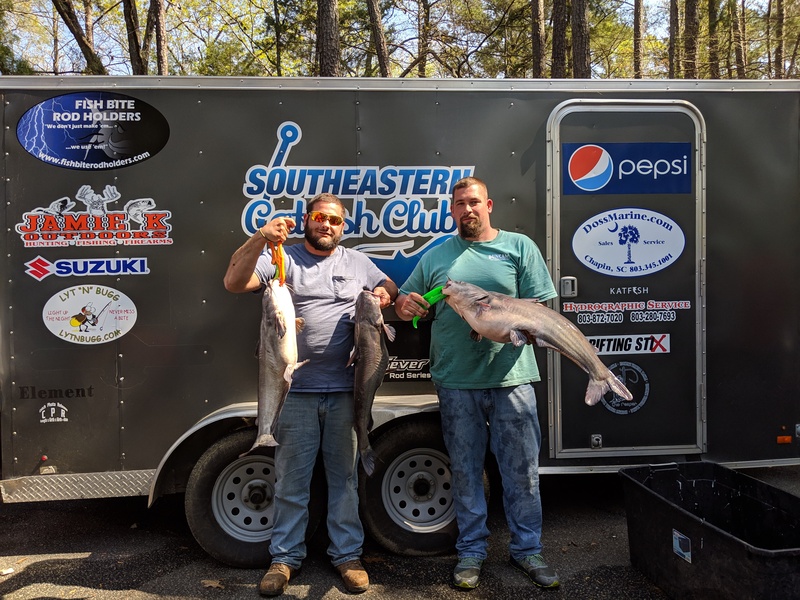 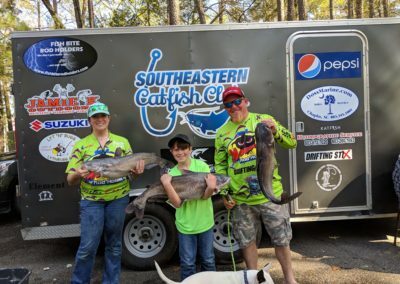 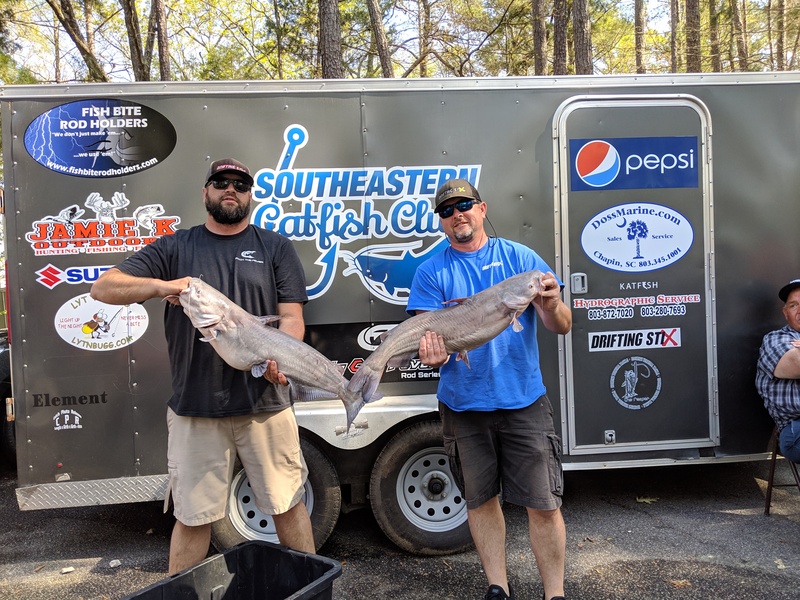 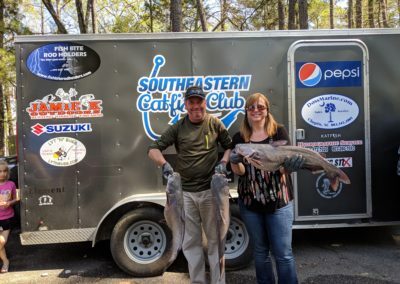 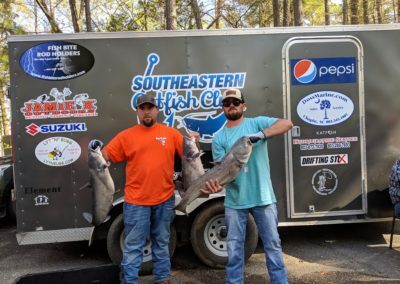 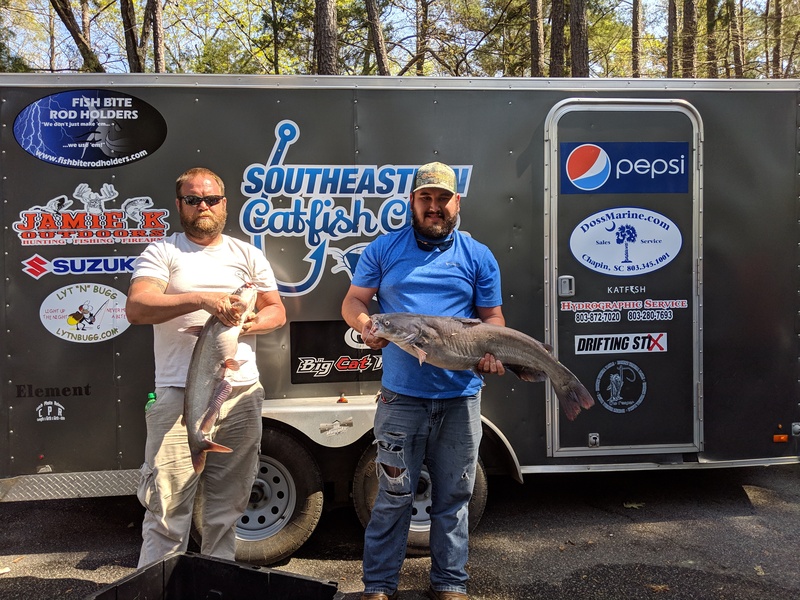 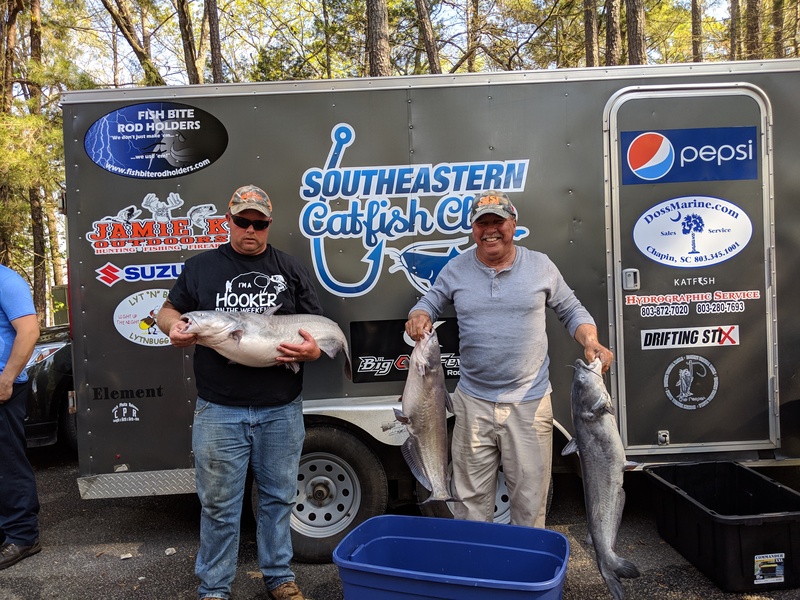 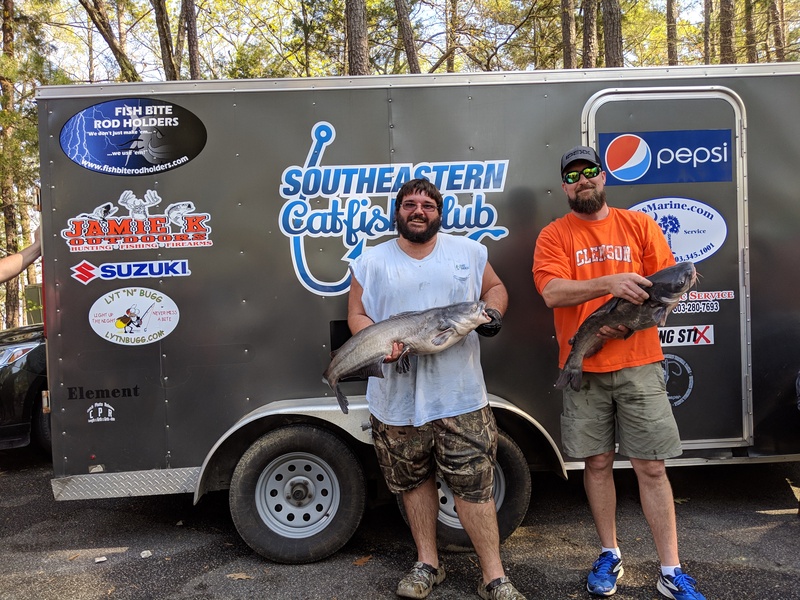 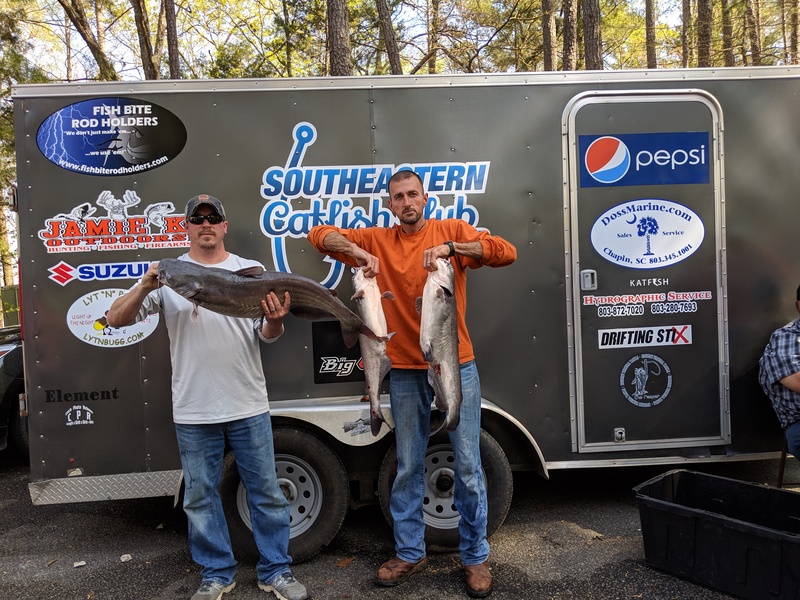 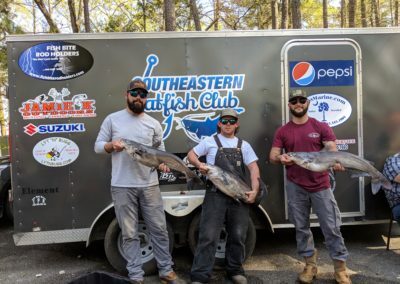 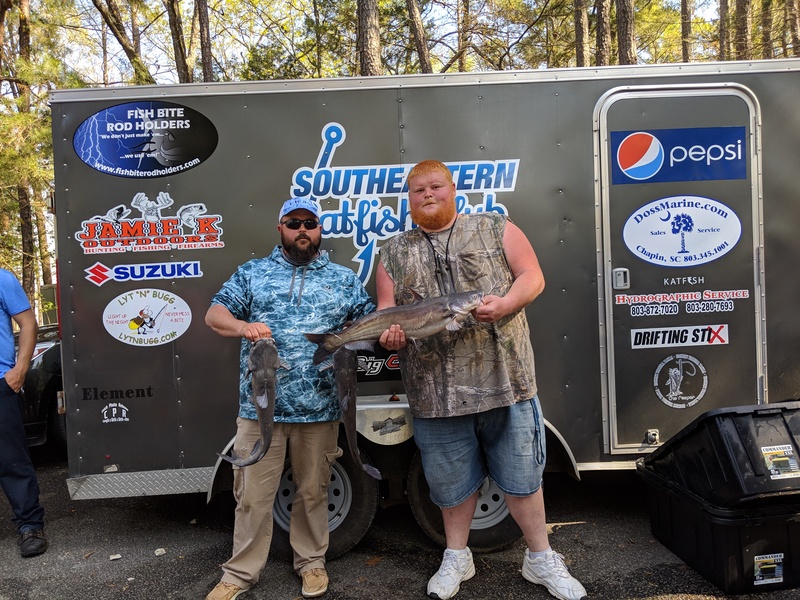 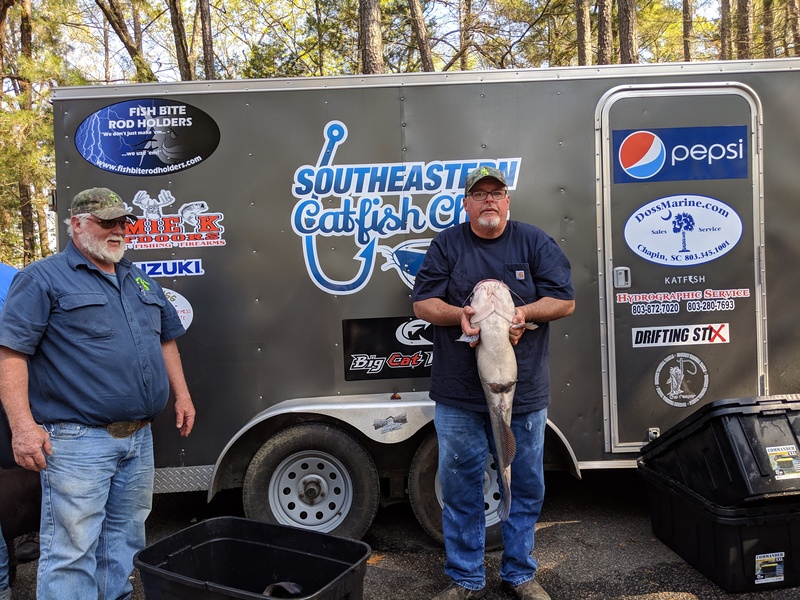 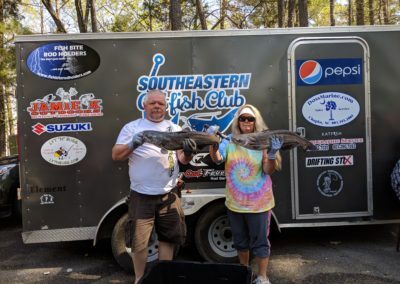 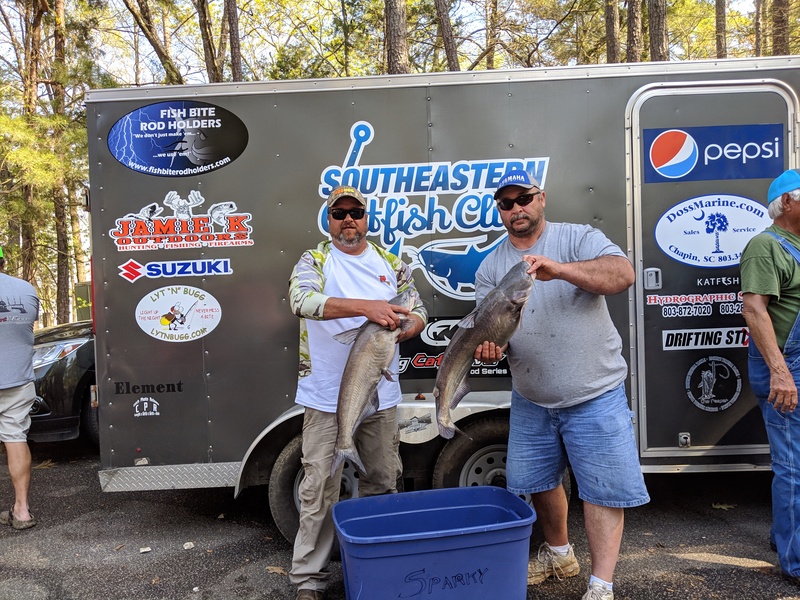 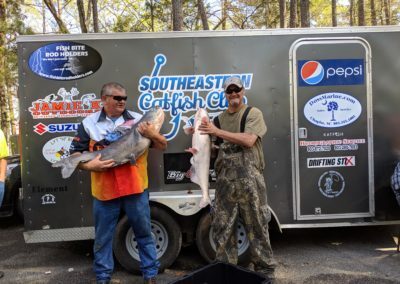 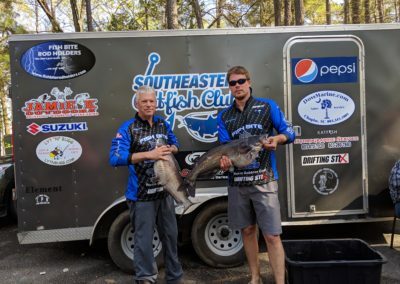 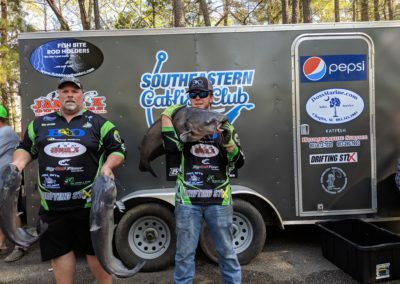 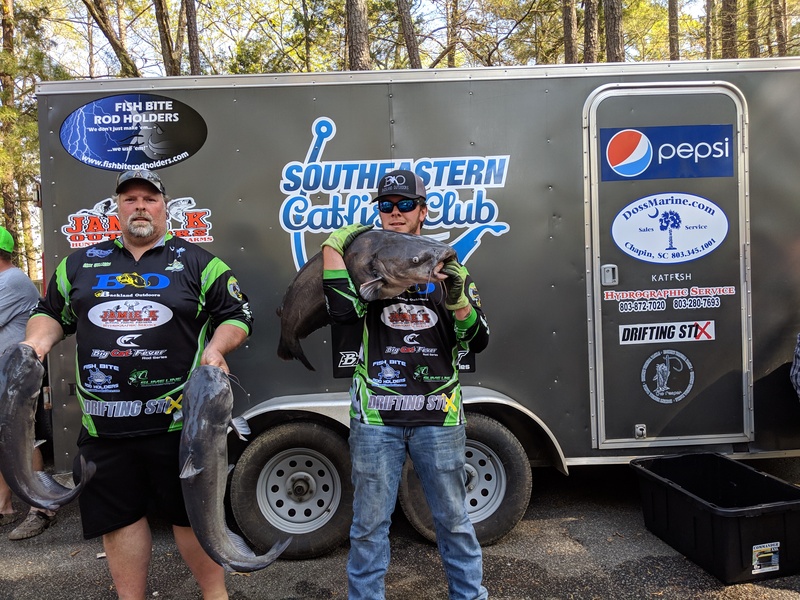 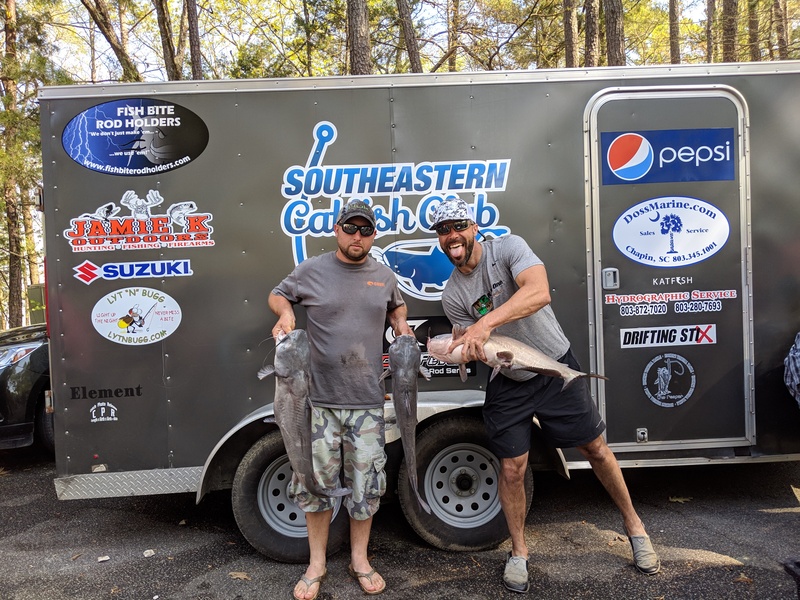 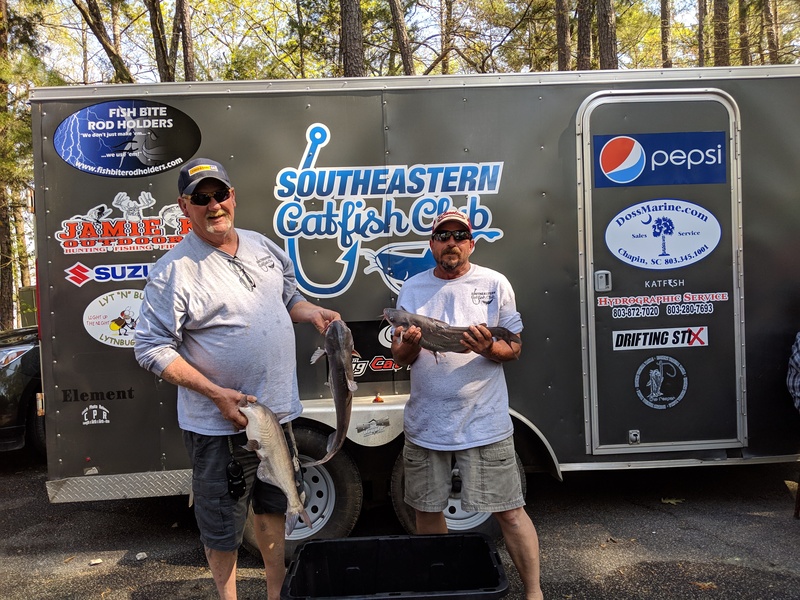 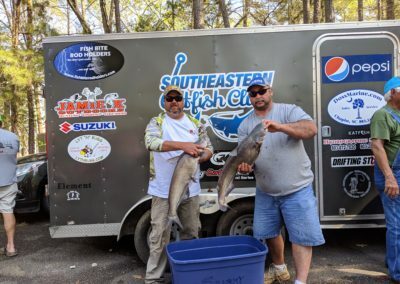 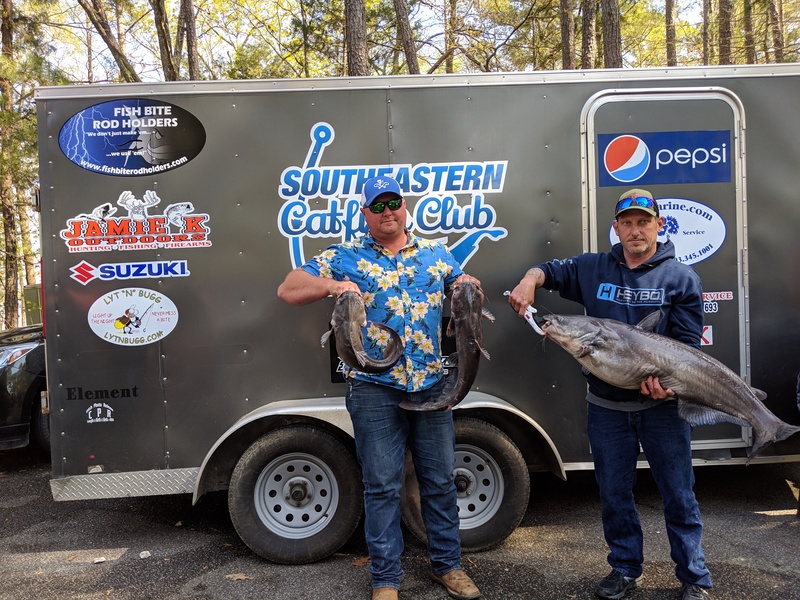 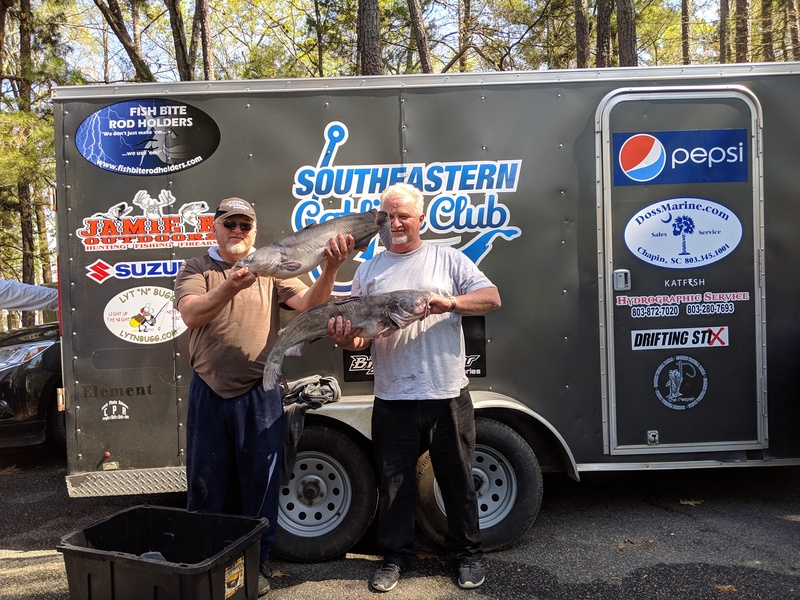 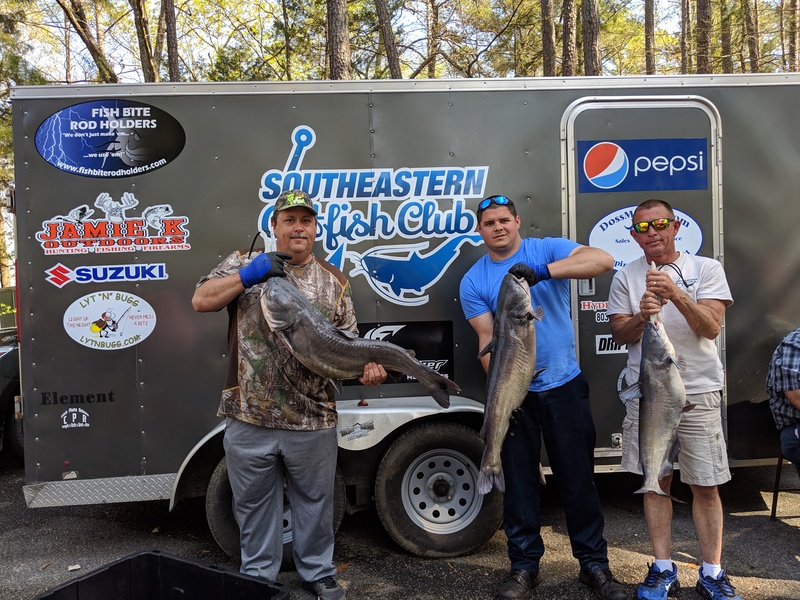 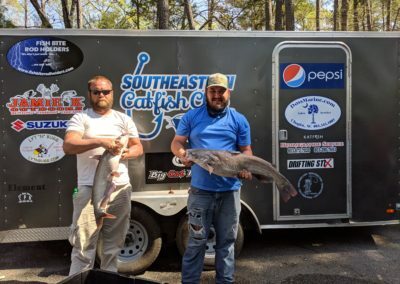 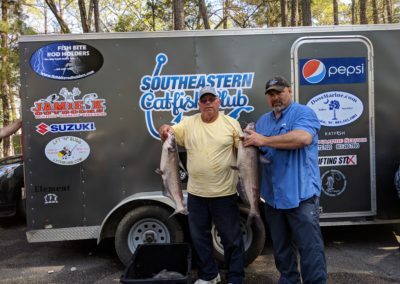 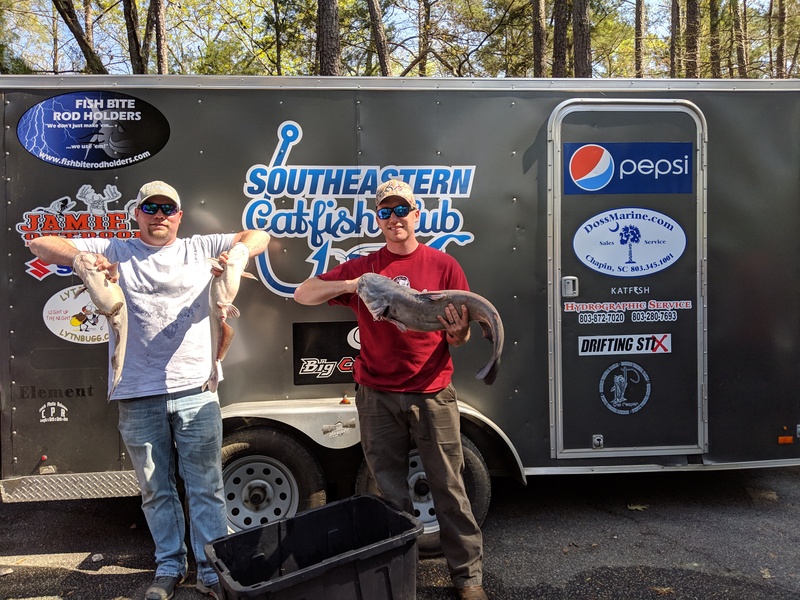 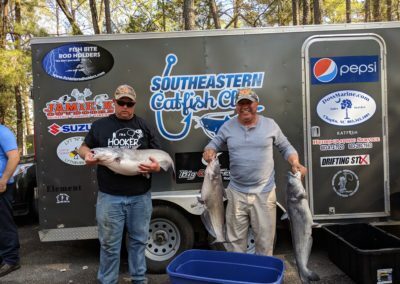 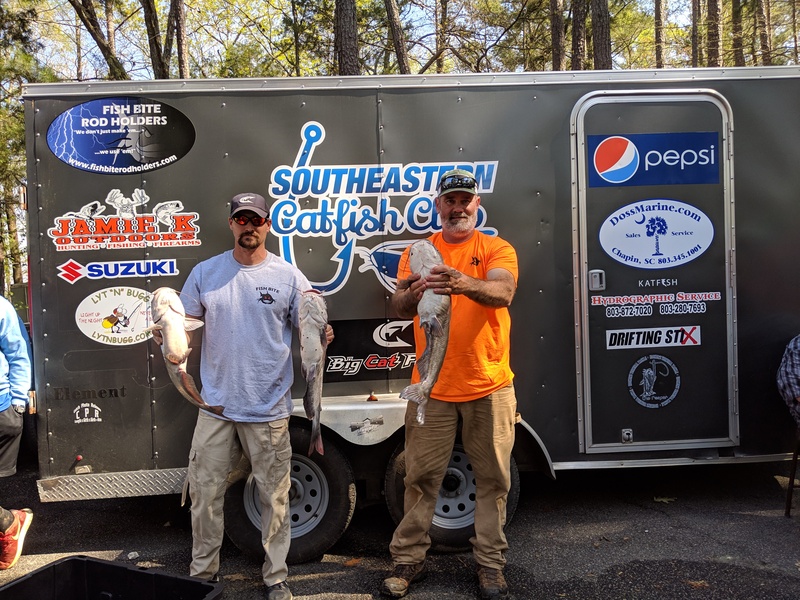 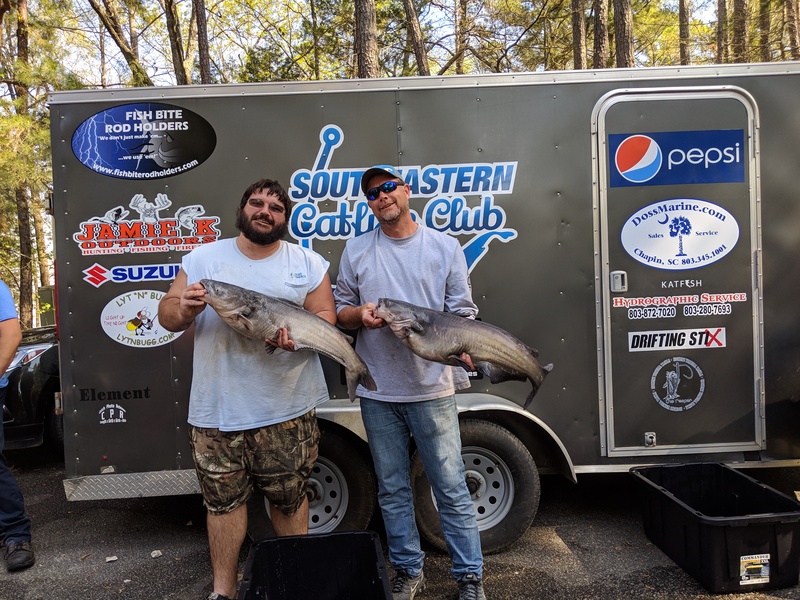 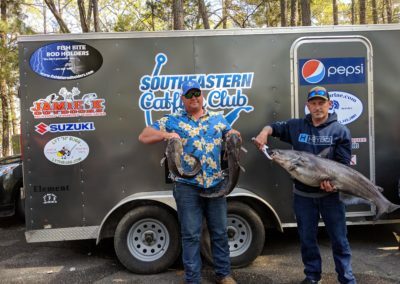 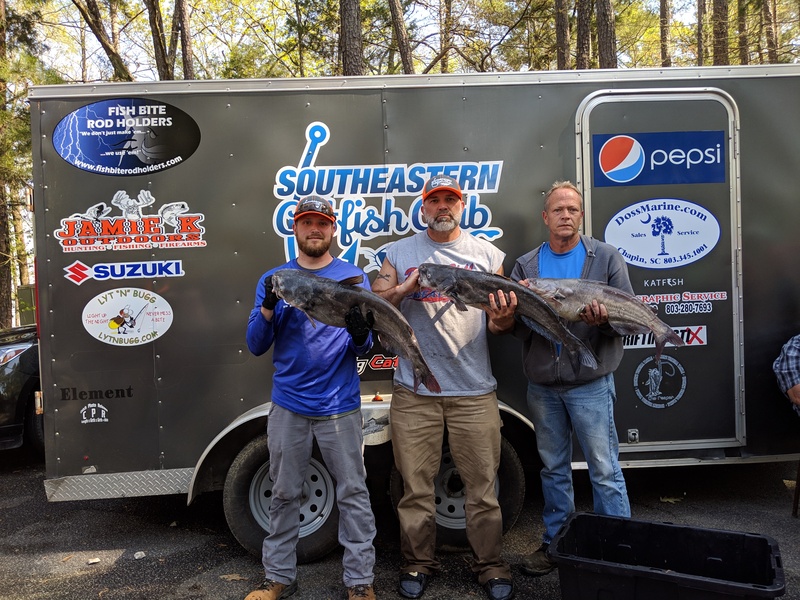 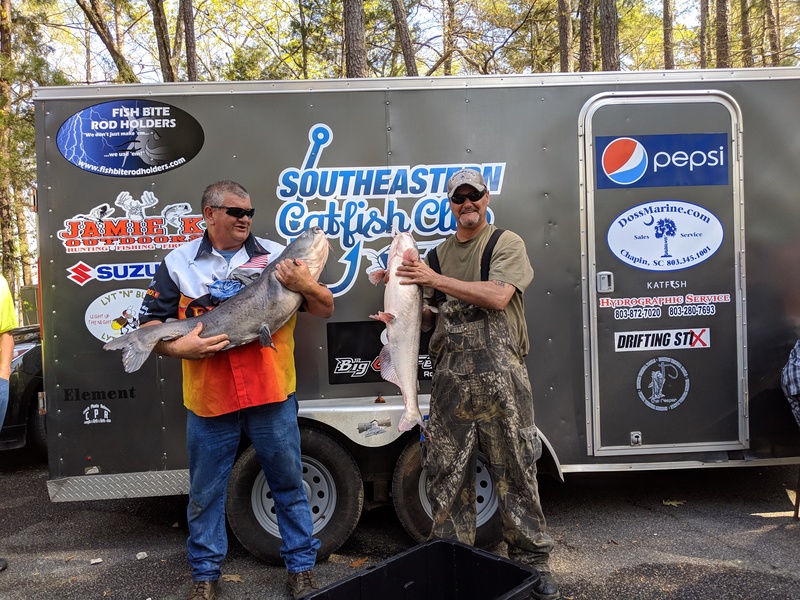 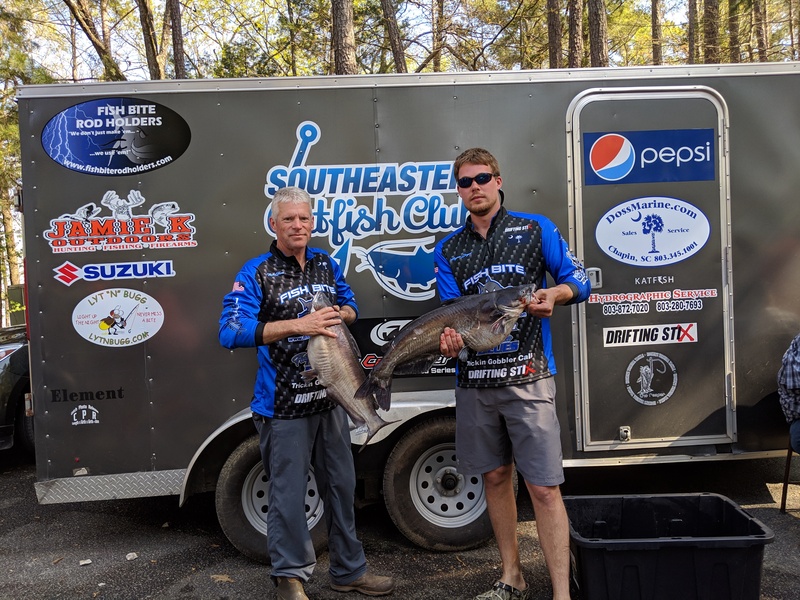 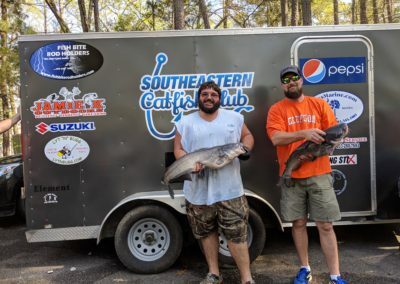 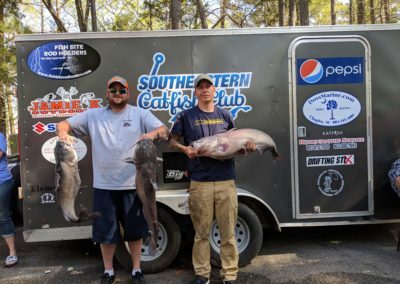 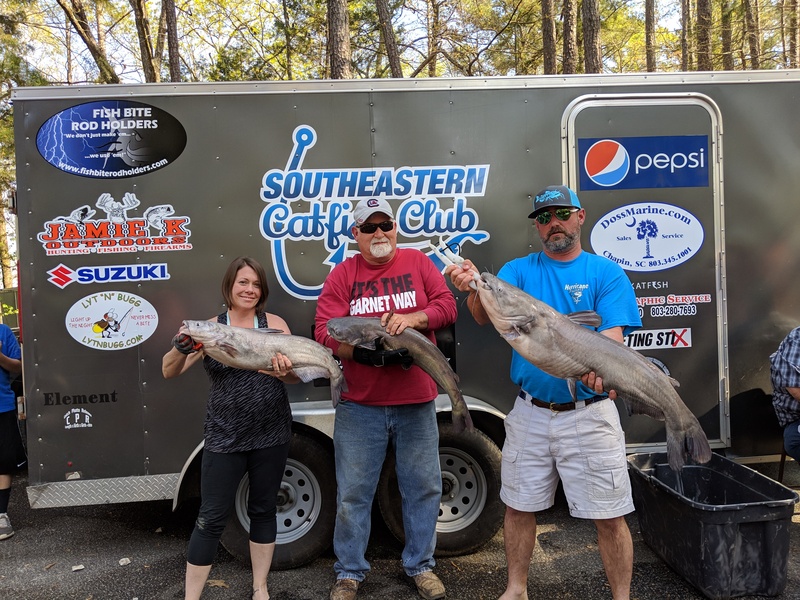 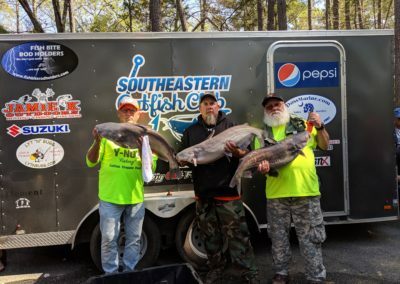 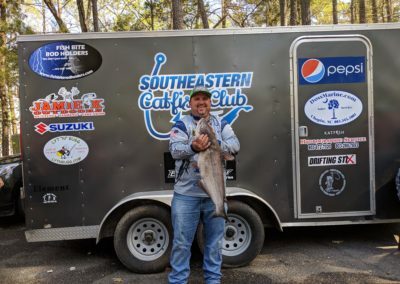 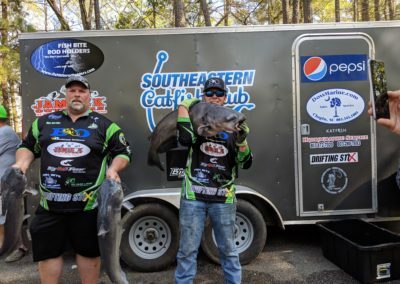 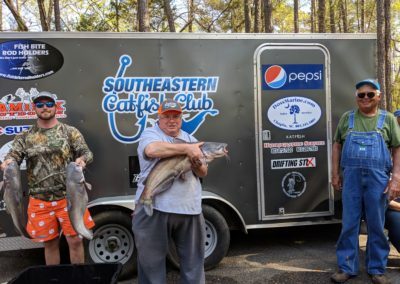 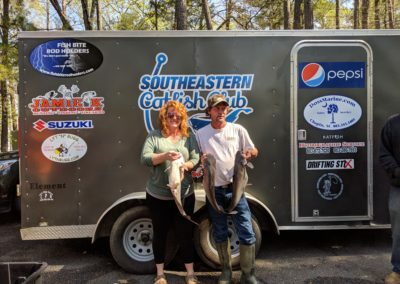 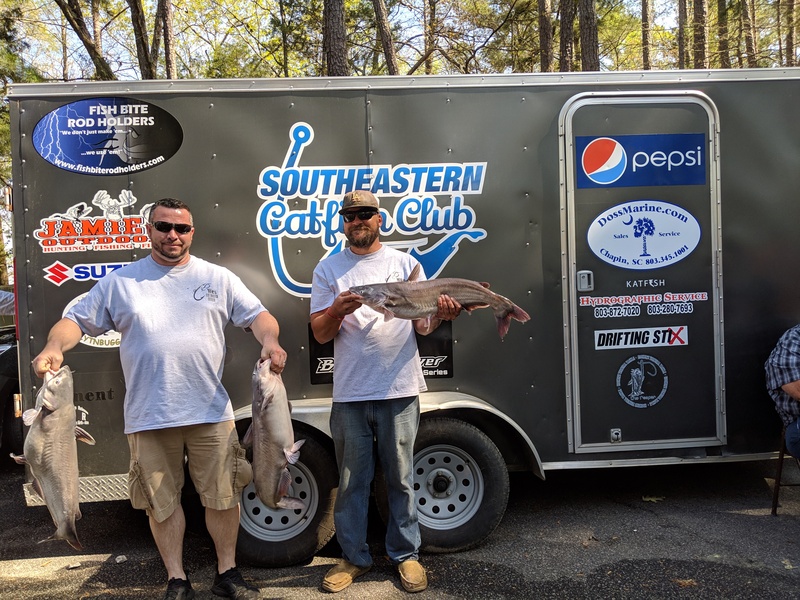 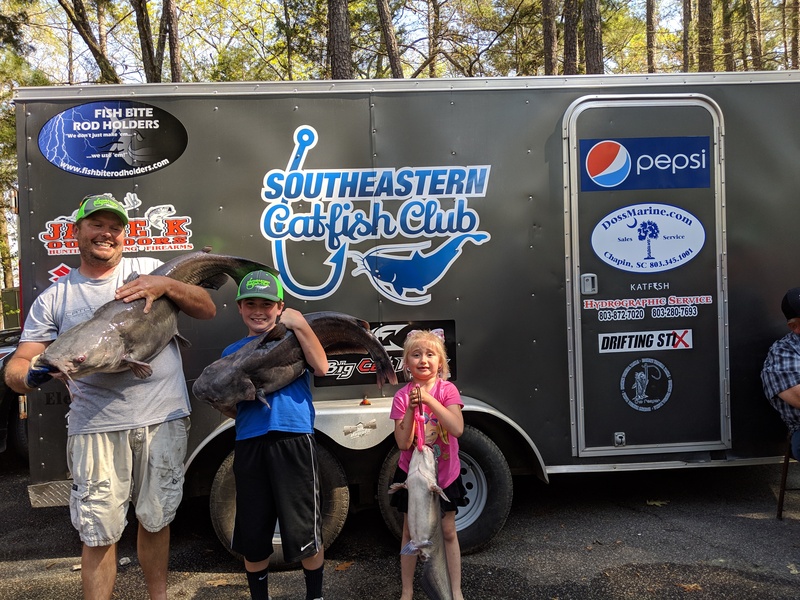 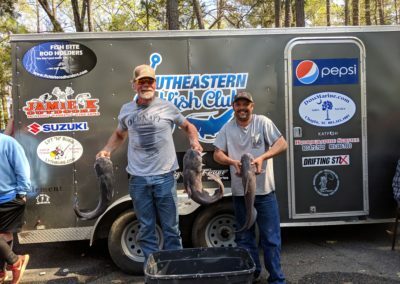 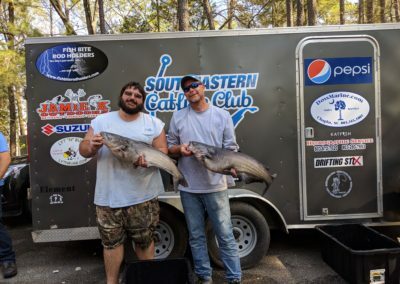 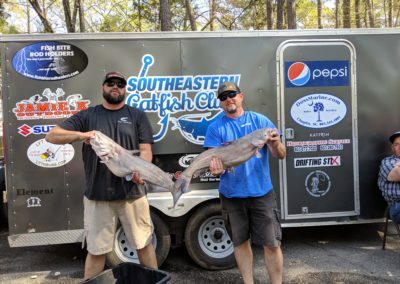 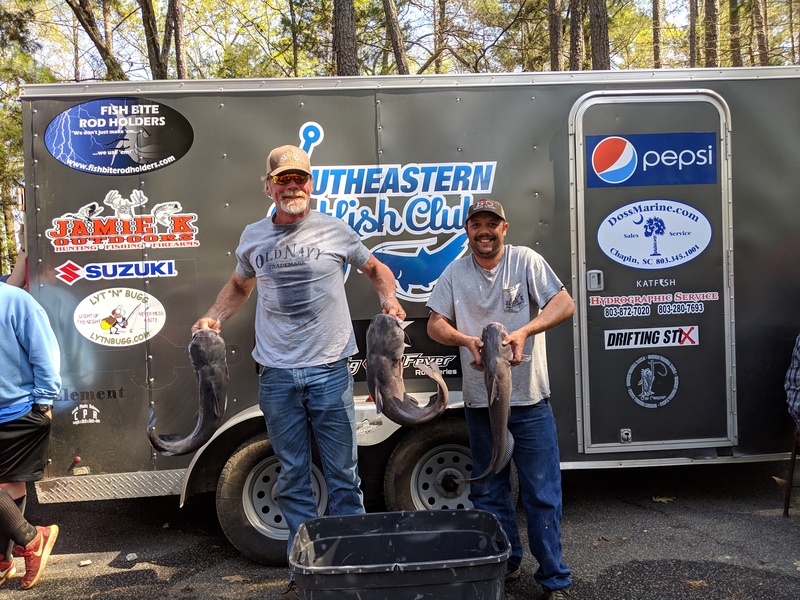 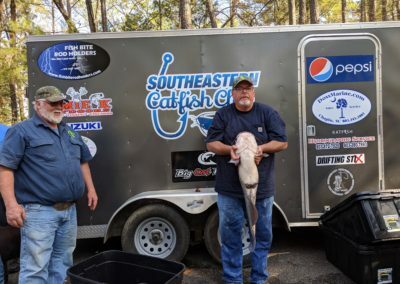 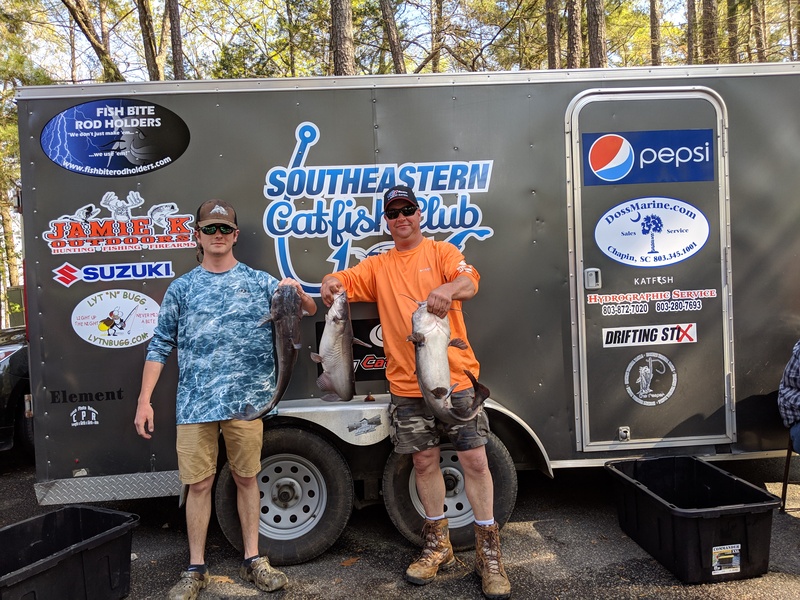 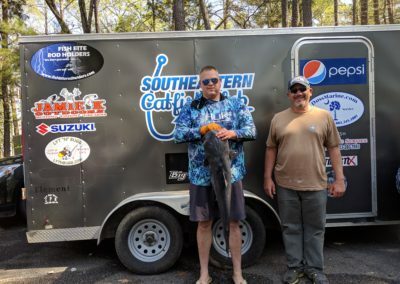 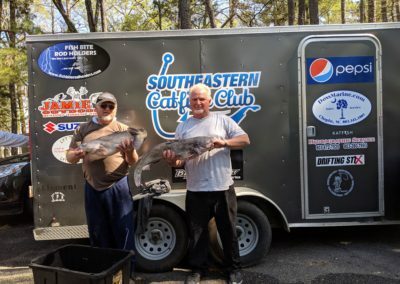 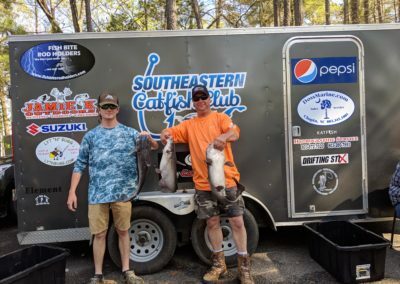 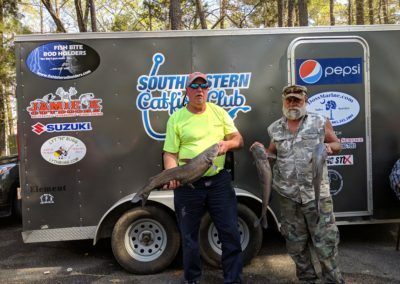 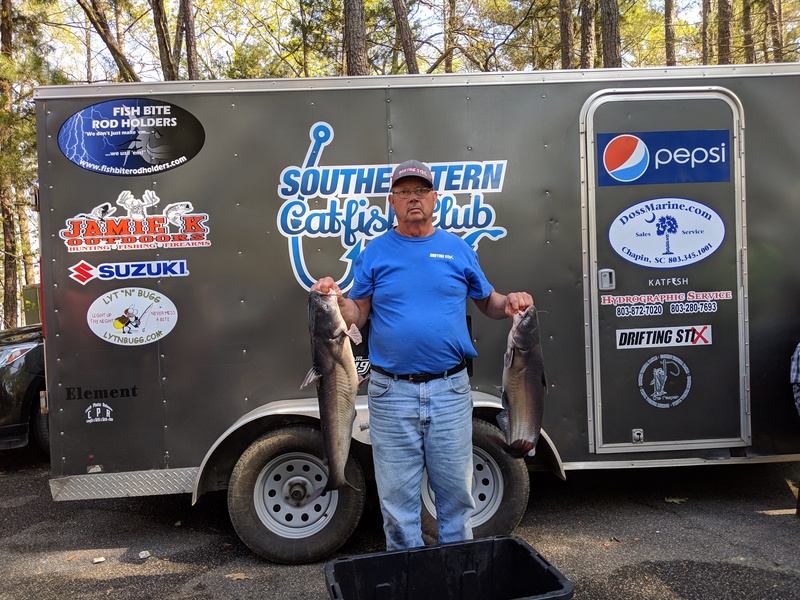 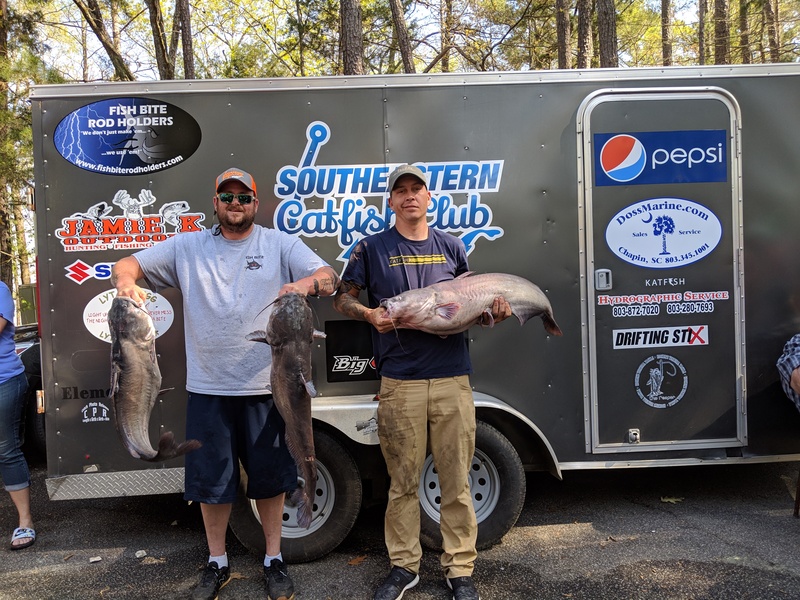 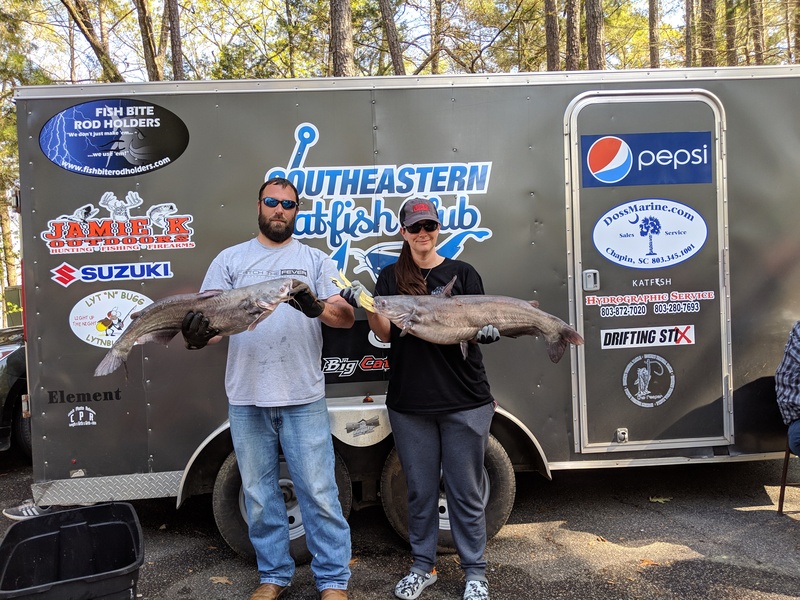 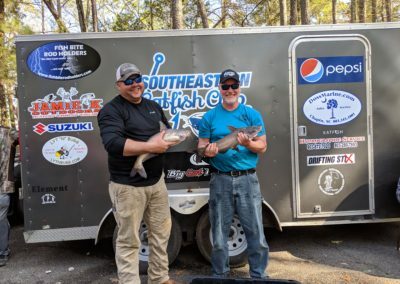 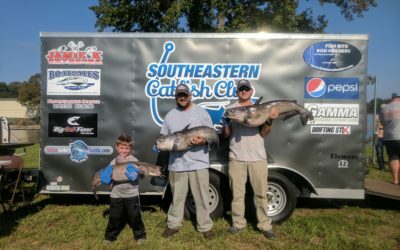 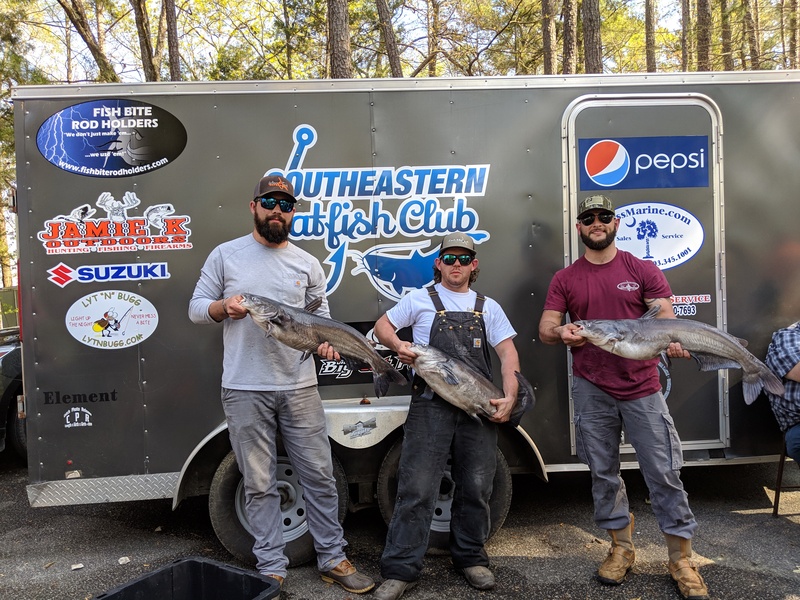 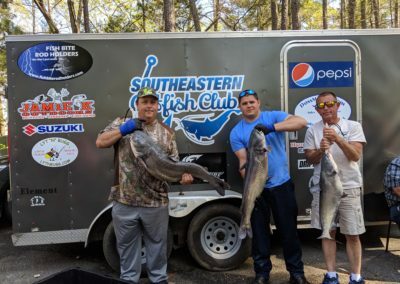 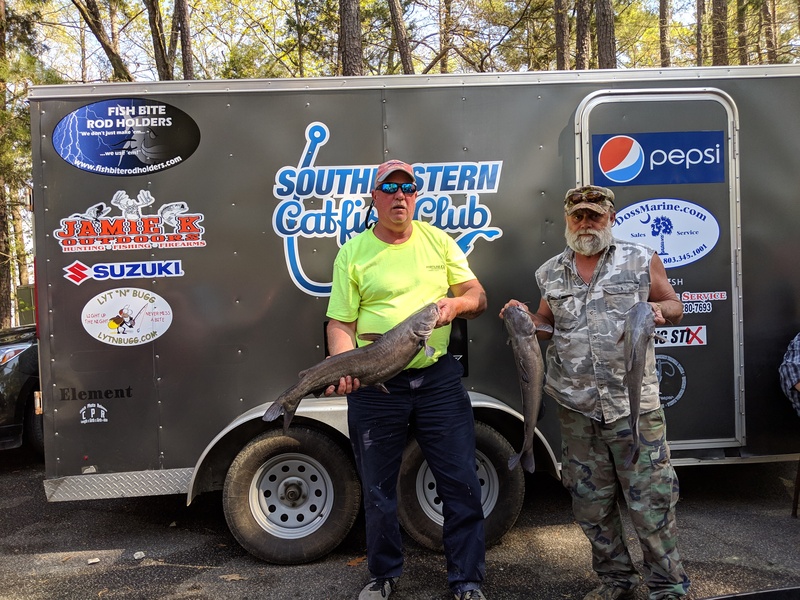 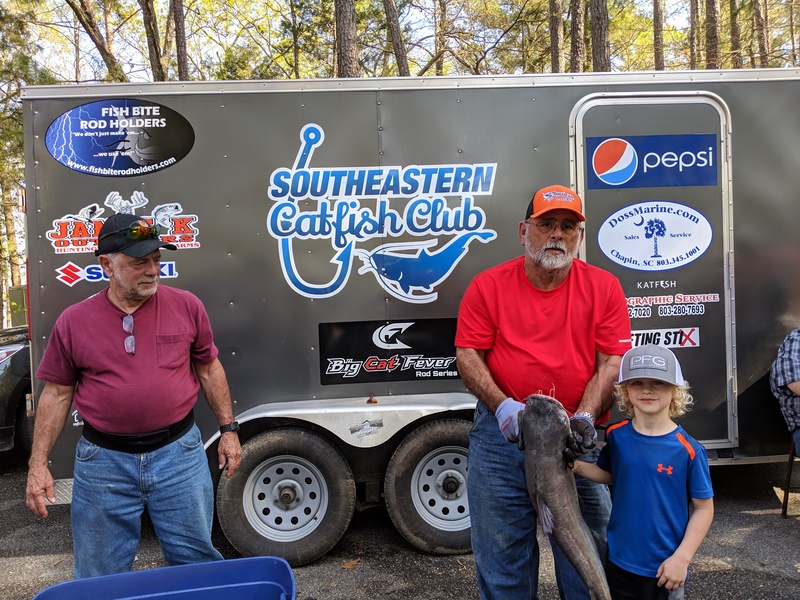 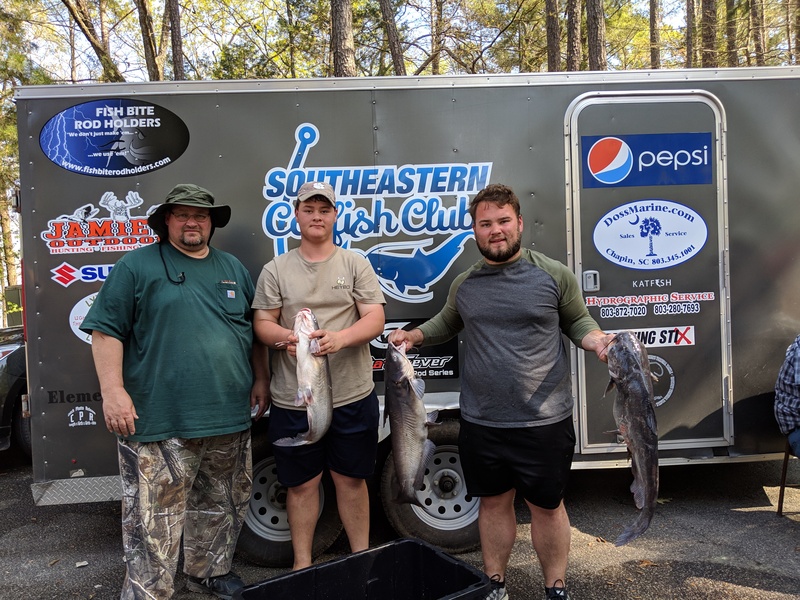 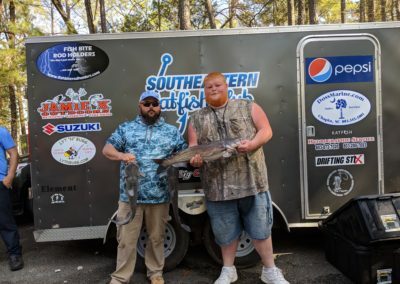 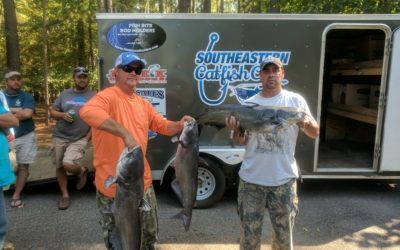 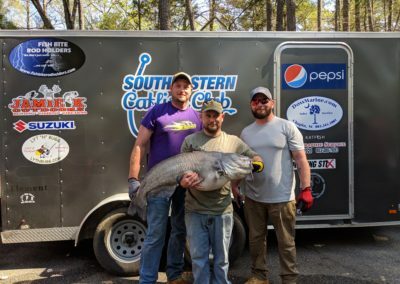 The Southeastern Catfish Club hosted its 8th tournament of the 2018-2019 season on Lake Wateree Saturday, April 6th, and it was another RECORD turnout! It was our 3rd time back to Lake Wateree this year, and we smashed the previous record with a total of 77 teams and 181 anglers eager to compete for their share of the $7,695 purse! 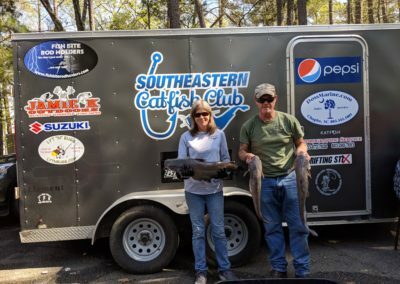 We would like to give a very special shout-out to Wendy for opening up the State Park store at 5:30am and giving anglers the chance to pick up last minute items and a cup of hot coffee. 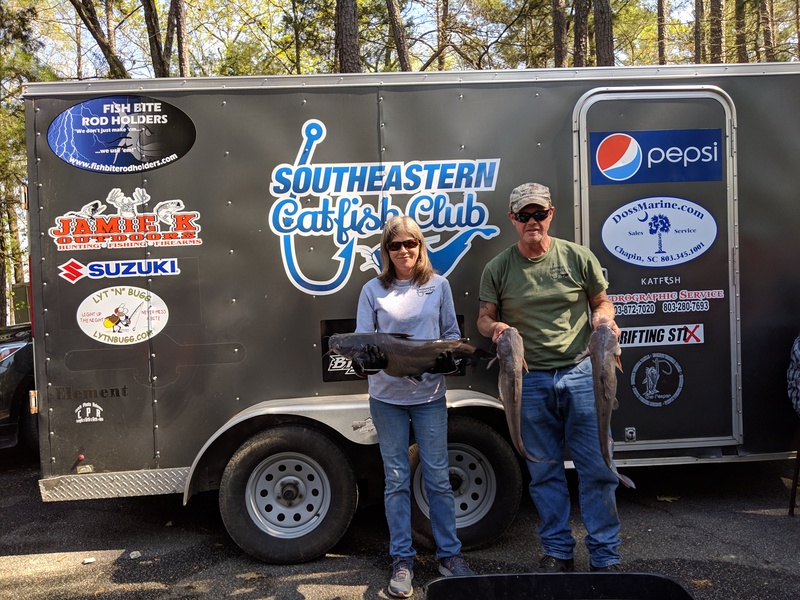 THANK YOU Wendy for making our tournament experience at Lake Wateree that much more enjoyable! 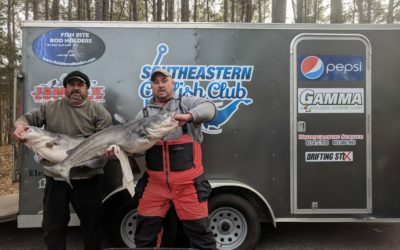 The week was full of crazy weather patterns leaving many to wonder what affect it would have on the weekend bite. 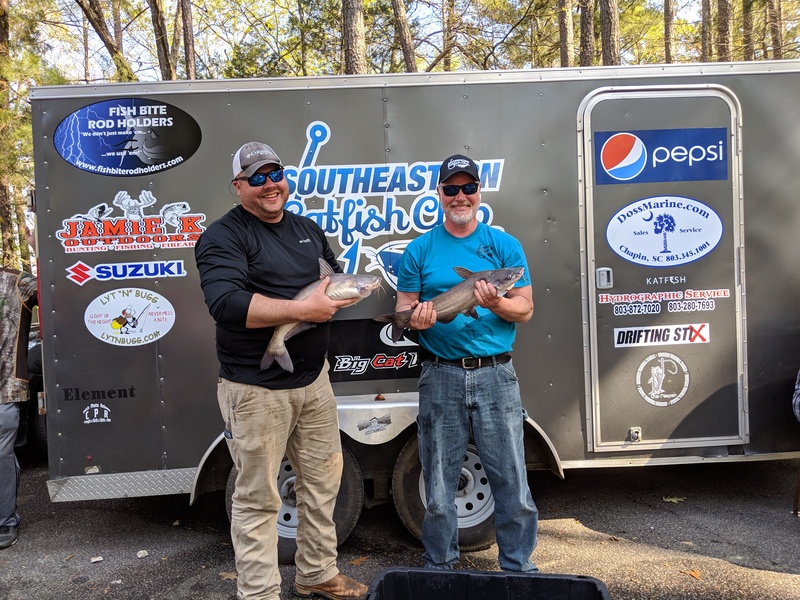 Earlier in the week, most of the region saw sunny skies with temps in the upper 50s turn into snow within a 24-hour period! 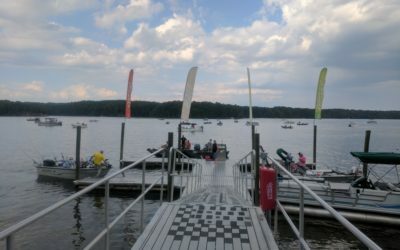 Temps moved back in the upper 60s, and rain settled in for the majority of the day on Friday. 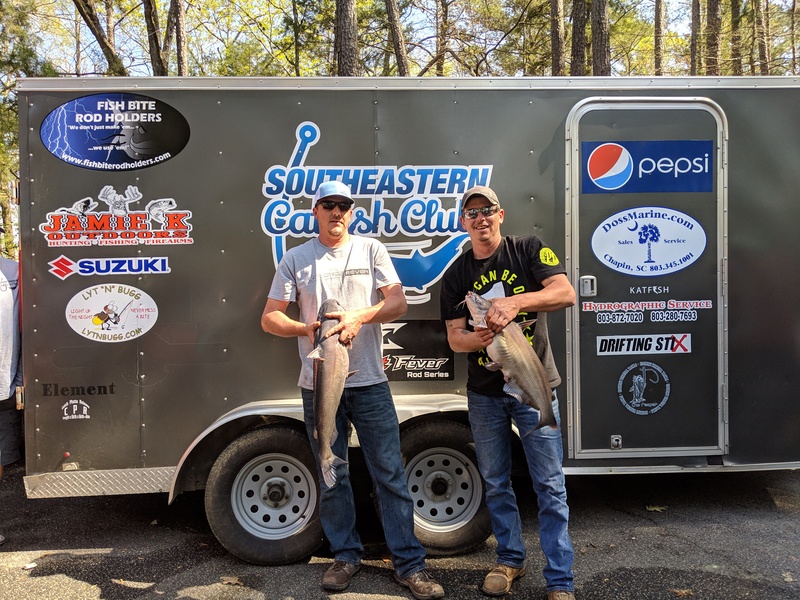 In the end, teams reported a tough bite, but father-son duo Jamie and Blake Williams of Team Backland Outdoors brought home the win with a impressive 72.55lb stringer collecting a massive $3,780! 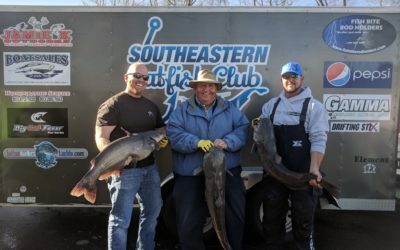 It’s the biggest payday in club history! 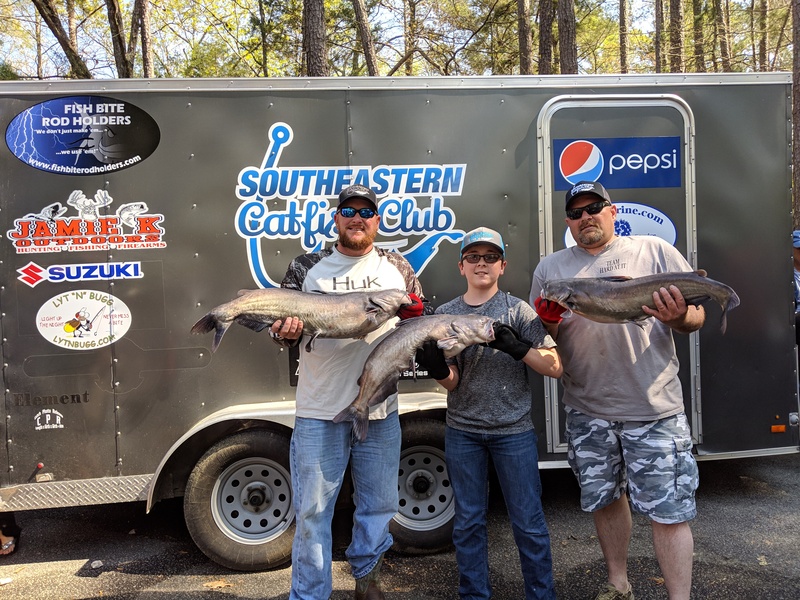 Joseph Spittle, Paige Spittle, and Christopher Helms of Team All Slimed Up wasn’t far behind with a 70.75lb stringer and collected $1,900 for their 2nd place finish. 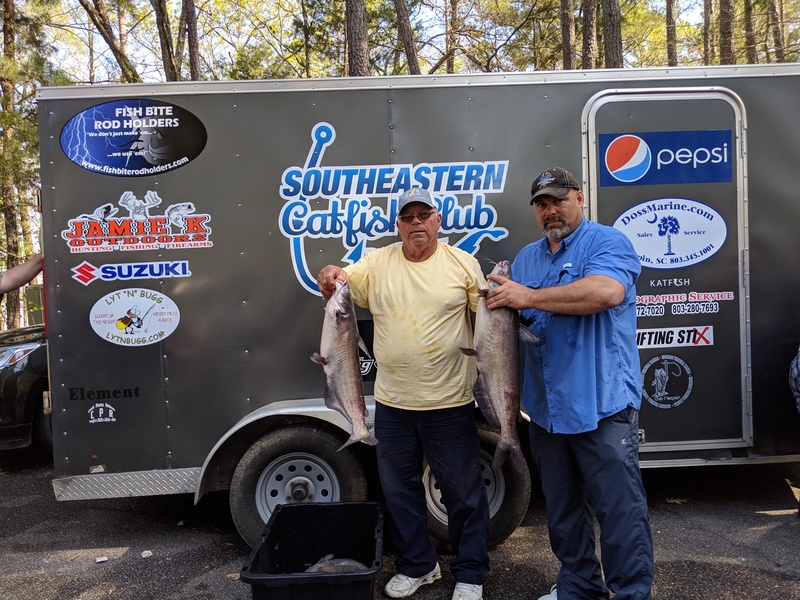 Less than 2lbs behind, Evan Martin and Larry Godwin of Team Let Em Pull finished in 3rd and took home $630. 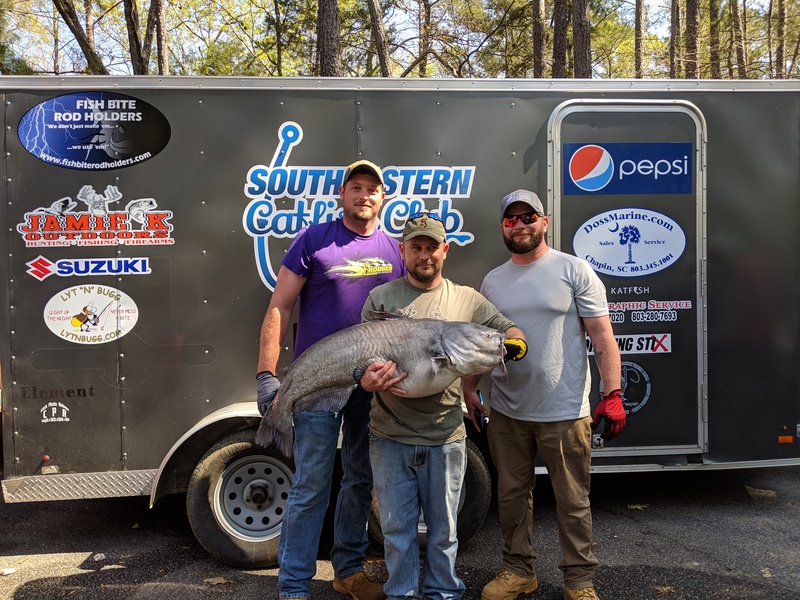 Jason Clinton, Chris Clinton, and Garrett Adkins of Team Katomatic took home Big Fish of the tournament honors with a bruiser 40.30lb blue and collected $970! 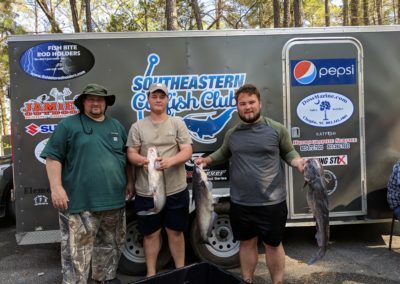 Justin Taylor, Josh Whitaker, and Brandon Shoffner of Team Ramrod had 2nd Big Fish of the Tournament with 40.25 blue and collected $415. It was the closest weight margin for the tournament Big Fish. 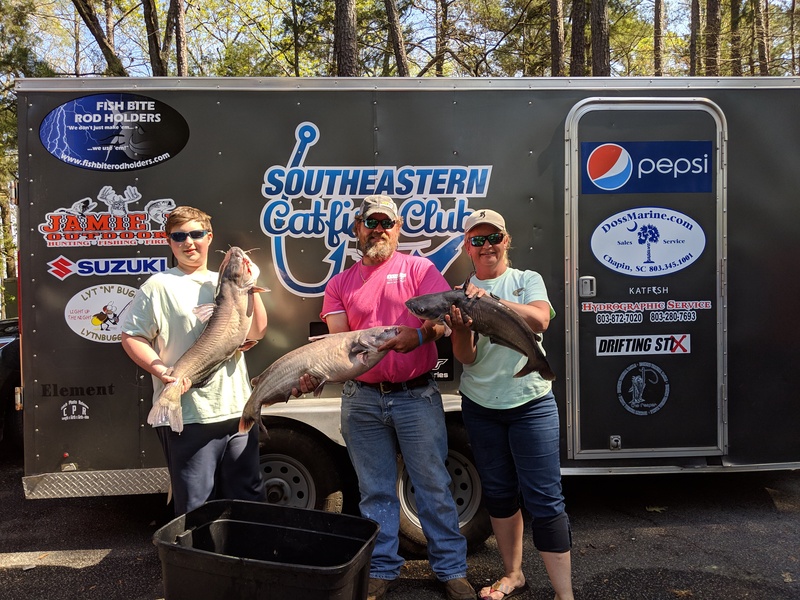 Congratulations to Jamie and Blake Williams of Team Backland Outdoors on their 1st win of the season! The Season’s Points Race is as tight as it can get coming down the home stretch, so next month’s season finale will determine our Points Champion! 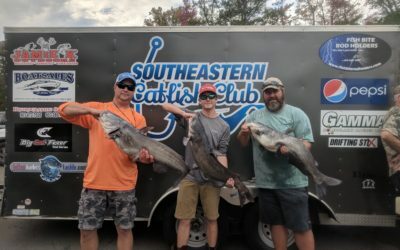 The club is certainly growing by the record number of teams coming out to join the fun, but we should feel most proud of the camaraderie that runs deep through our members. 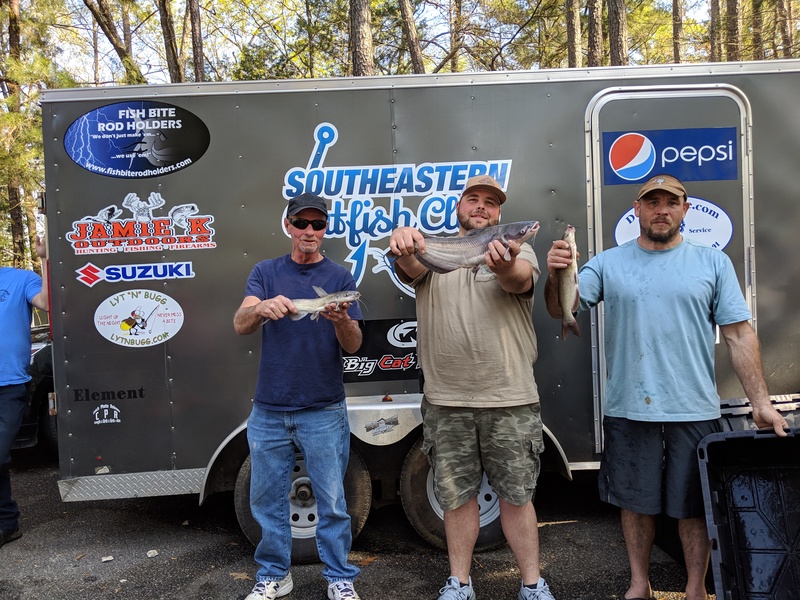 A new tradition continued this month where the winners from the previous tournament gave away a portion of their earnings today. Some have chosen to reward the smallest stringer or the 4th place team. 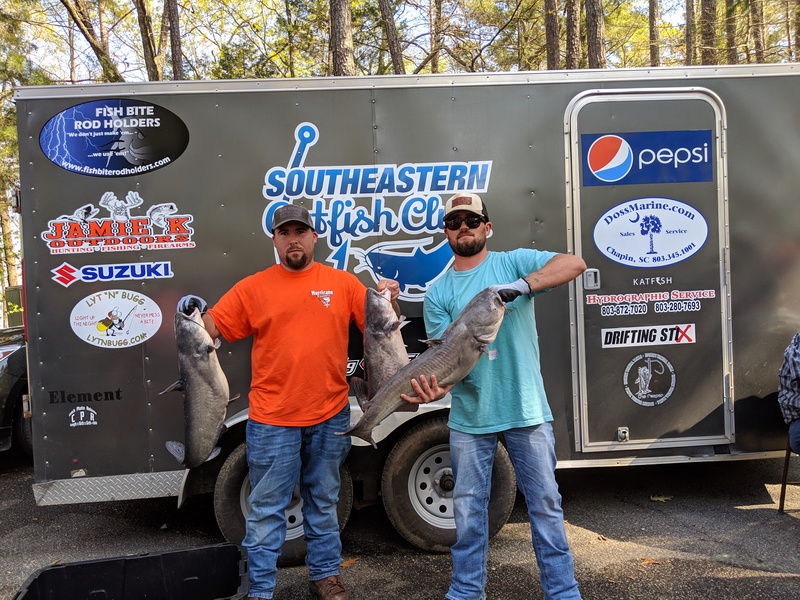 Jacob Williams and Lee Cowan of Team Bluehead, who finished 1st in last month’s tournament, rewarded a $50 gift card to a randon draw. 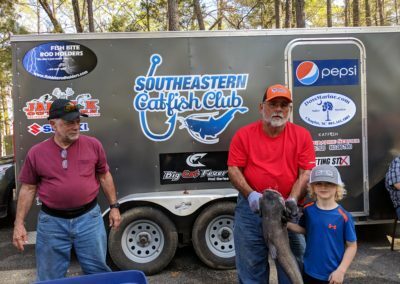 We appreciate you guys for keeping the tradition alive! 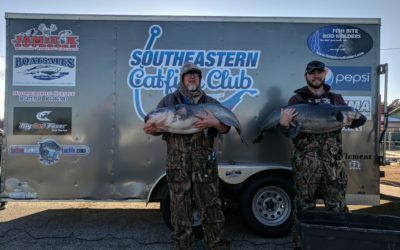 As the crowd waited to tally up the results, we collected donations for the United Special Sportman Alliance charity. 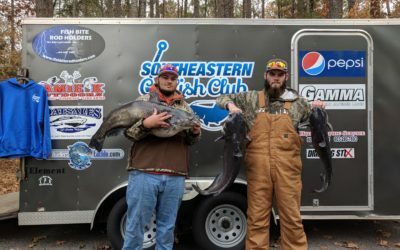 The impromptu ask was simple, but the response was over overwhelming! 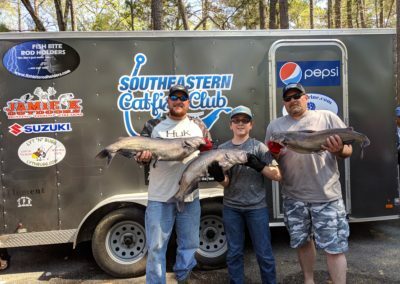 The USSA is hosting a fishing event for special needs kids and their families on April 20th. 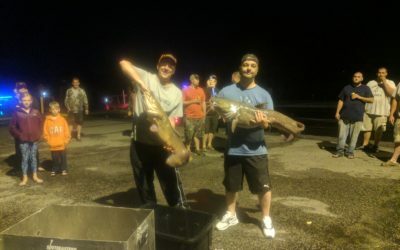 They were about $400 short of their goal to cover hotel expenses for families traveling from out of town. 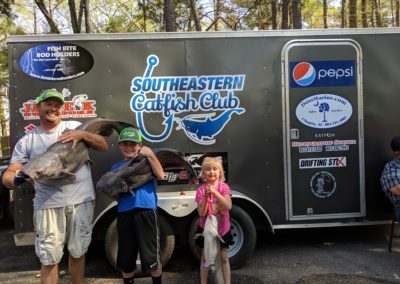 Club members didn’t hesitate to chip-in, and we collected $440! 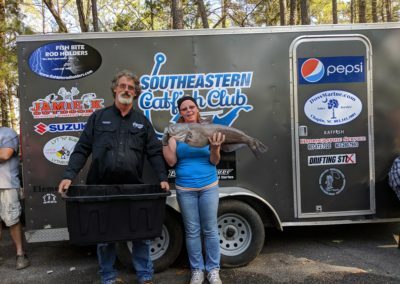 It’s acts of kindness like this that make our club extraordinary! 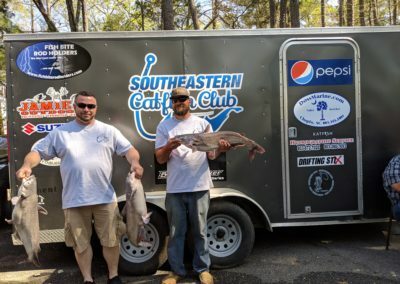 Finally, we would like to give a special Thank You to our sponsors that continually show their support to our club! 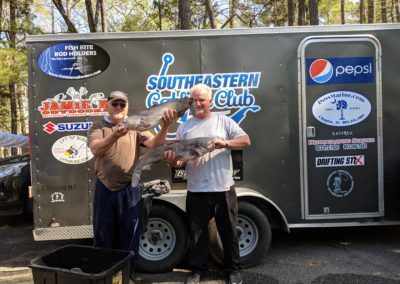 They make the tournament experience that much more exciting for our members. 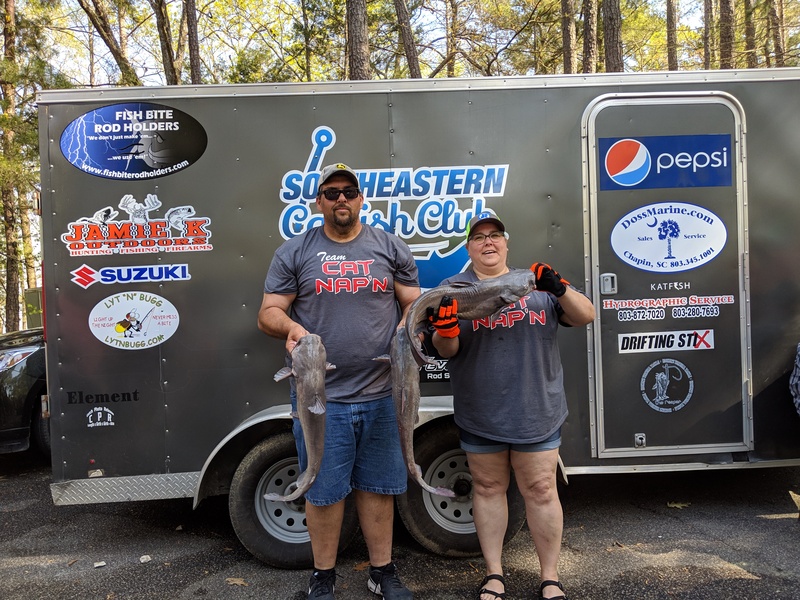 Jamie Williams with Jamie K Outdoors gave away a $50 gift certificate to Team Reelin’ the Blues for the random draw award. 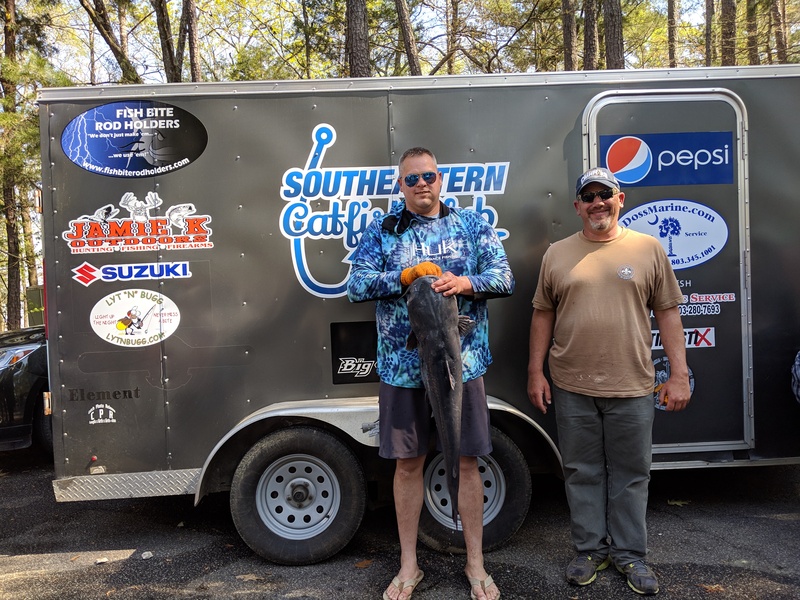 Jamie also gave away another $50 gift card to Team SC Slime Time for having the smallest 3-fish stringer. 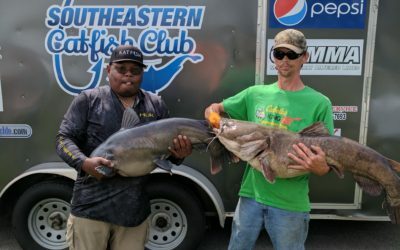 The fellas at Lyt “N” Bugg, in quirky fashion, picked the team that had the closest weight to 49lbs to award $50 cash. 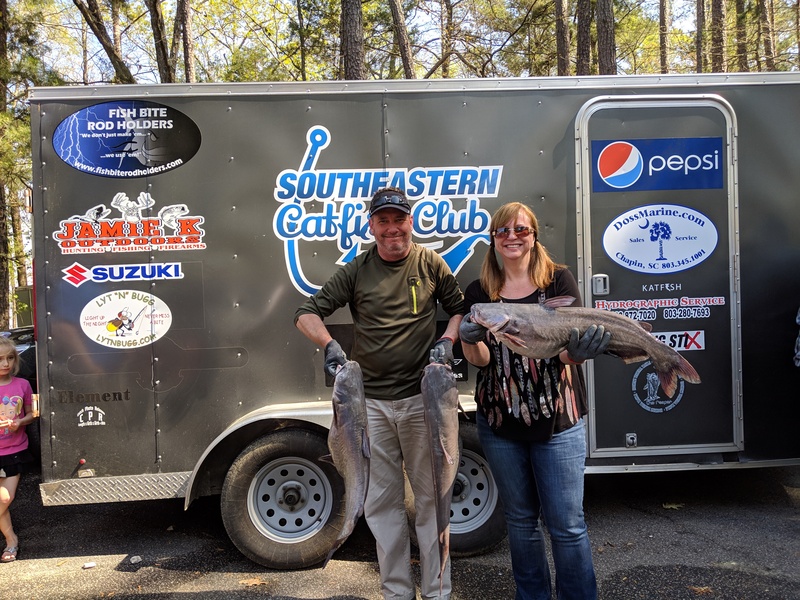 Team Buchanan won the honors. 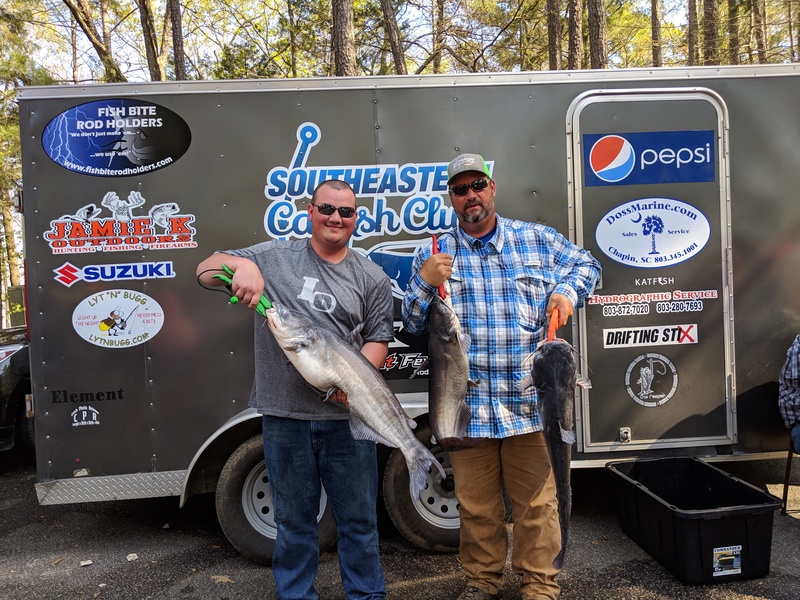 Club member Shane Owenby with his new brand Rod Hog gave $50 of cold, hard cash to the 8th place team, and Team Tightline took it home. 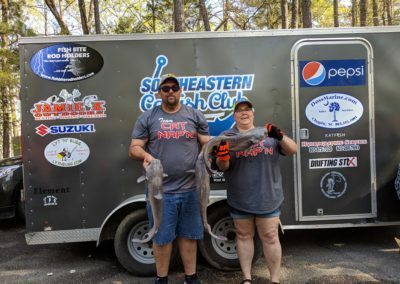 It’s getting very interesting on what and how you can win, so be sure to stick around even though your team had a tough day! 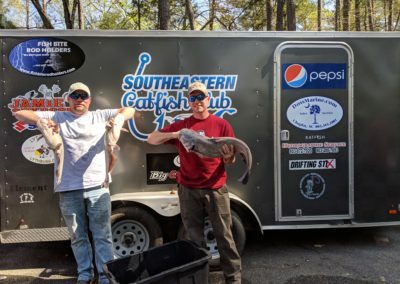 As we announced last month, we had two national sponsors come onboard giving teams a chance to win additional bonus money and prizes. 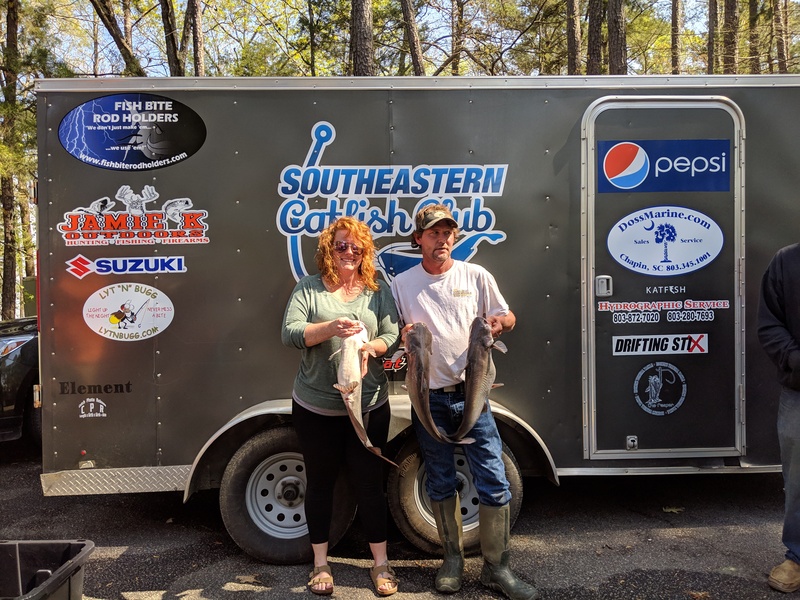 SeaArk paid a whopping $500 to the top finishing SeaArk, and husband-wife duo Cary and Vicky Vanden Brock Team Reel Addiction won the honors with their 48.30lb stringer. Suzuki gave away a maintenance kit to the top finishing team that’s powered by a Suzuki outboard. 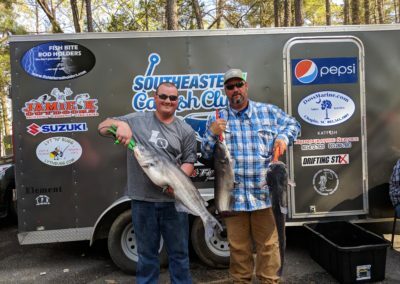 Brian Snipes and Bubba Branch of Team Tightline won the incredible package with their 58.40ln stringer! 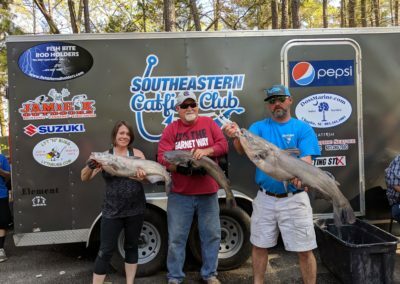 We’re down to the last and final tournament next month on Lake Wylie, so come on out and join in on the fun! 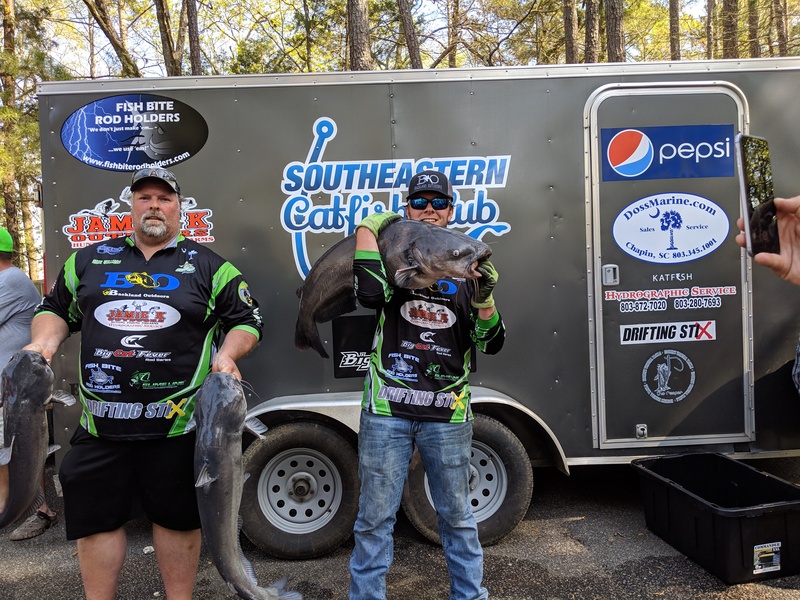 Check the pictures from the weigh-in below.